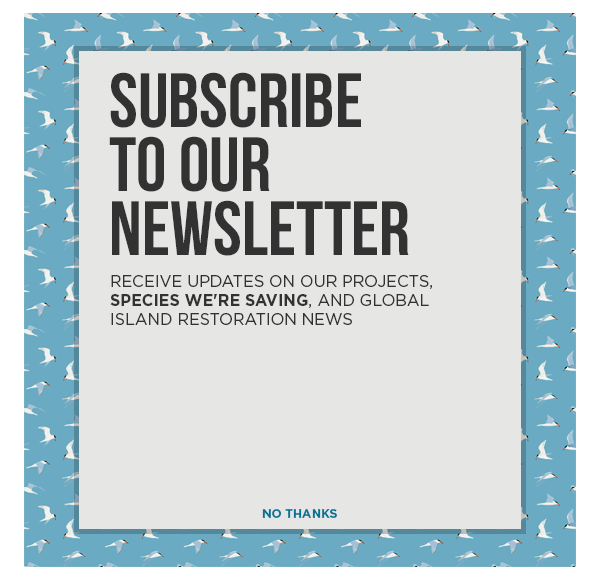 Invasive rats appear to be gone from Lehua Island after officials conducted a restoration project to protect threatened seabirds. The `iwa or Great Frigatebird swept low over a cluster of trucks, stacks of equipment and a Jet Ranger helicopter on the northern end of Niihau. As I followed its black-winged form with binoculars, the angular bird made several passes and then returned to its roost on Lehua Island, a gray-brown tuff cone island, just a thousand yards across the Kumukahi Channel from Niihau. Teams of wildlife professionals worked both Niihau and Lehua in late August and early September, using a helicopter guided by computer mapping programs to deliver rat bait across the rugged islet. I was present for one of the sessions. A month after the final application, indications are that rats no longer populate Lehua. Survey teams are finding no footprints at burrows or other indications of rat activity, according to Sheri Mann, head of the Kauai office of the state Division of Forestry and Wildlife. They will keep monitoring for the next year, to confirm that preliminary finding. The Lehua Island rat eradication project should improve habitat for frigatebirds and dozens of other bird and plant species on the little island — just as wildlife has thrived after similar eradications at other offshore Hawaiian islands, like Mokolii Island off Oahu and Mokapu off north Molokai. After eradication of black rats on Mokolii, successful shearwater nesting became common, coastal naupaka sprouted, and seashore rat-predated species like pipipi and a ama crab became abundant. At Palmyra Atoll to the south of Hawaii, after rat removal long-absent seabird species established successful nests, shoreline fiddler crabs thrived, and native tree seeds sprouted where they once were eaten. Lehua has now been given three applications of pale blue pellets of rat bait containing diphacinone — less than a pound of the anticoagulant in several thousand pounds of food grade cereals like wheat and oats and other rat-friendly food items. The new bait was developed by Bell Laboratories in Madison, Wisconsin. We’ve had really high acceptance rates of this new, more palatable bait. The Lehua operation’s partners include the state Division of Forestry and Wildlife and its parent agency the State Department of Land and Natural Resources, U.S. Fish and Wildlife Service, U.S. Department of Agriculture’s National Wildlife Research Center in Hilo, Niihau Ranch, U.S. Coast Guard, National Tropical Botanical Garden and several other associated organizations and agencies. The $1 million Lehua project has funding from several sources, including the Department of Land and Natural Resources, National Fish and Wildlife Foundation and Island Conservation. The results will be monitored for several years. Several hundred small islands from the equator to the arctic have now been cleared of rats and other invasives. Why islands? Because although their land area is small, they are important crucibles of biological diversity — home to many endangered species, and once home to many species now extinct. One species, the tiny band-rumped storm petrel, is now entirely missing — arguably because its small size and noisy habits on the nest make it particularly vulnerable to rats. Perhaps on a rat-free Lehua, it will be able to re-establish itself. Meanwhile, planning in Hawaii is already underway for a much bigger challenge — clearing the island of Kahoolawe of species like mice that are inhibiting the island’s revegetation. The Kaho’olawe Island Reserve Commission is in discussion with Island Conservation and others about the best ways to accomplish that goal. Jan TenBruggencate is a veteran science and environment writer, formerly with the daily newspaper The Honolulu Advertiser, and currently with his blog, www.RaisingIslands.com. He is an author and communications consultant and is an elected board member of Kaua`i Island Utility Cooperative, the island's electric company.